Originally known as the Unitas Fratrum, the Moravian Church traces its roots to 15th century central Europe, in what is now the Czech Republic. A Protestant episcopal church, it suffered severe persecution during the 17th century. However, in the 1720s a number of families which had continued the church's original traditions were given refuge in Saxony by Count Nikolaus Ludwig von Zinzendorf. Here, at a new community named Herrnhut, the Unitas Fratrum was renewed and revived. In the process it merged its older practices with Zinzendorf's Lutheran Pietism. Under his leadership, Moravian influence spread across Protestant Europe, and by the time of Zinzendorf's death in 1760, there were 13 Moravian settlements in Germany and the Netherlands, and settlements and congregations in England, Ireland and Britain's North American colonies. It was Zinzendorf who turned the renewed Unity into a missionary church. Through his connections at the Danish court, the first Moravian missionaries went to Danish possessions - to St Thomas in the West Indies in 1732, and to Greenland in 1733. The Danish connection also led to expeditions to southern India and western Africa. By the 1760s, the Moravians had begun to work in Surinam, Jamaica, Antigua, Barbados and among North American Indians. In 1751, a group of merchants attached to the Moravian congregation in London decided to outfit a trading and missionary voyage to the Labrador coast the following year. A mission house was built at what is now Ford's Bight, near Makkovik, and named Hoffnungsthal (Hopedale). This expedition ended in tragedy when its leader, Johann Christian Ehrhardt, and six companions, were killed by Inuit. 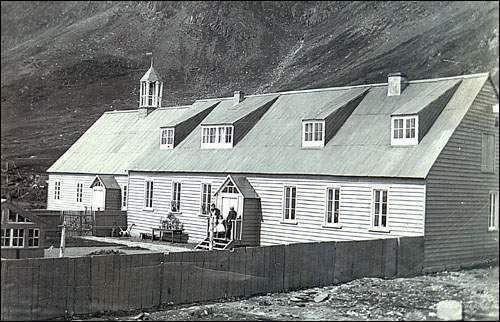 The idea of a Labrador mission was taken over by another missionary in Greenland, Jens Haven. After the end of the Seven Year's War (1763), he received the necessary permission and went to London to find a passage to Labrador. Here he met the Governor of Newfoundland, Sir Hugh Palliser, who understood that the Moravians might be very useful in helping to end the endemic warfare between Europeans and Inuit which made southern Labrador and the Strait of Belle Isle a dangerous place. Palliser sponsored Haven's visit to the area in 1764, as well as a second expedition the following year, when Haven went to Labrador with three colleagues. 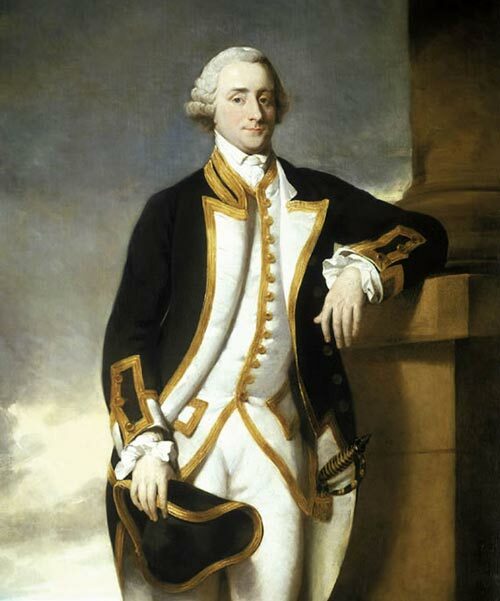 Governor of Newfoundland from 1764 to 1768, Palliser thought that the Moravians might be useful in helping to end the conflict between Europeans and the Inuit. Lengthy negotiations concerning the establishment of a mission then followed. Finally, in 1769 the British government agreed to grant to the Unitas Fratrum and the Society for the Furtherance of the Gospel (SFG), a missionary organization of the British Moravians, the right to occupy and possess "at His Majesty's pleasure" 100,000 acres of land at "Esquimaux Bay". This had been the Moravians' key demand, since they wanted the right to keep other Europeans at a distance. In 1770 Haven led another expedition to Labrador, and selected a site for a mission station. The following year a missionary party consisting of three married couples and eight single men founded the settlement at Nain. This was the first Christian mission to Inuit in what is now Canada. Nineteenth century lithograph by an unknown artist. 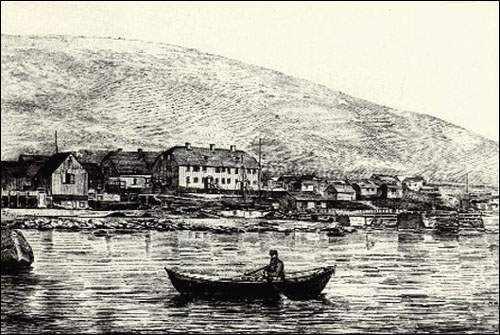 In 1771, Moravians established a settlement at Nain which became a permanent settlement and the Moravian headquarters in Labrador. Courtesy of Dr. Hans Rollmann. From Archives and Special Collections (Siegfried Hettasch Collection), Queen Elizabeth II Library, Memorial University of Newfoundland, St. John's, NL. The Moravians soon established two more stations - Okak in 1776, and a new Hopedale at Arvertok in 1782. Each station consisted of a communal dwelling house, a church, a trading store - managed by the SFG, the profits covering at least some of the costs of the mission - and various outbuildings. The missionaries kept gardens, and there was a graveyard. Those Inuit who chose to live near the mission built sod houses nearby. Most converts came to the stations between Christmas and Easter only. Okak was established in 1776. This photo was taken sometime before 1919. Courtesy of Archives and Special Collections (Coll - 137, 22.03.001), Queen Elizabeth II Library, Memorial University of Newfoundland, St. John's, NL. The early years of the mission were difficult, and the process of conversion slow and discouraging. A breakthrough occurred in the early 19th century, however, and by 1818 some 600 Inuit were attached to the three stations. The mission expanded over the next century, establishing Hebron in 1830, followed by Zoar (1865), Ramah (1871), Makkovik (1896) and Killinek (1905). The mission now served the growing settler population on the northern coast as well as the Inuit, and its trade faced increasing competition from the Hudson's Bay Company. Courtesy of Archives and Special Collections (Coll - 69, 7.24), Memorial University of Newfoundland, St. John's, NL. During the 19th century there were between 30 and 40 missionaries on the coast at any one time, most of them Germans. All learned Inuktitut, which was the language used in church and school, and they usually remained in Labrador for long periods of time. Their children were sent back to Europe for education. The annual visit of the SFG's vessel - usually named Harmony - was the Moravians' main link with the outside world. Significant changes came with the 20th century, and the mission came under pressure to modernize and change its ways. In any event, the Moravian Church began a process of financial retrenchment after 1909 which was then reinforced by the impact and aftermath of the First World War. Zoar and Ramah had already closed, in 1889 and 1908 respectively. Okak followed in 1919, its population devastated by the Spanish influenza epidemic. Killinek, impossibly remote and in Canadian territory, closed in 1925. The trade was transferred to the Hudson's Bay Company in 1926, ending the Harmony's annual voyages. The number of missionaries declined, but began to include a higher number of British Moravians, since after the war Labrador became a responsibility of the British church. With the movement of people from the northern coast to the Lake Melville area during Second World War, Moravian congregations were established in due course at Happy Valley and North West River. 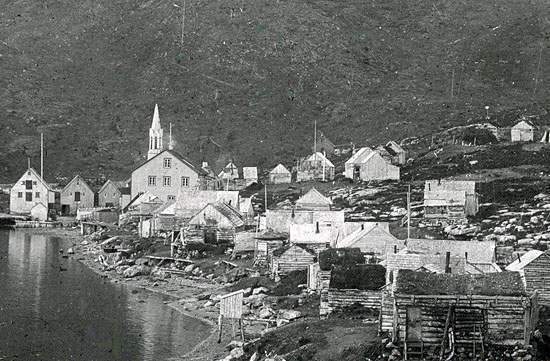 The mission headquarters moved from Nain to Happy Valley, a clear sign of the new order that was coming to Labrador. 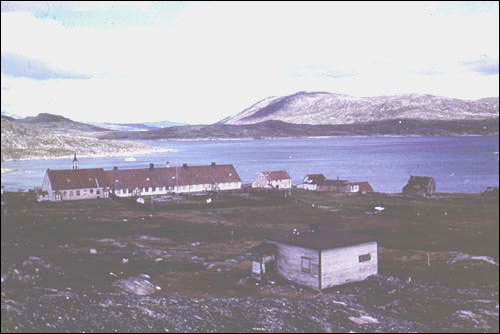 The provincial government took over the Moravian schools, and the International Grenfell Association assumed full responsibility for medical services along the coast. Even before Confederation, the Newfoundland government had been forced to take over trading operations. In a highly controversial move, Hebron was closed in 1959 and its population moved to the remaining settlements. The deserted Moravian mission buildings at Hebron. The community was abandoned in 1959. Reproduced by permission of Dr. James Hiller, Memorial University of Newfoundland, St. John's, NL, ©1961. Moravian congregations exist still in Labrador's Inuit communities. Distinctive Moravian buildings, once characteristic of all the mission stations, survive at Hopedale and Hebron under the care of Parks Canada.